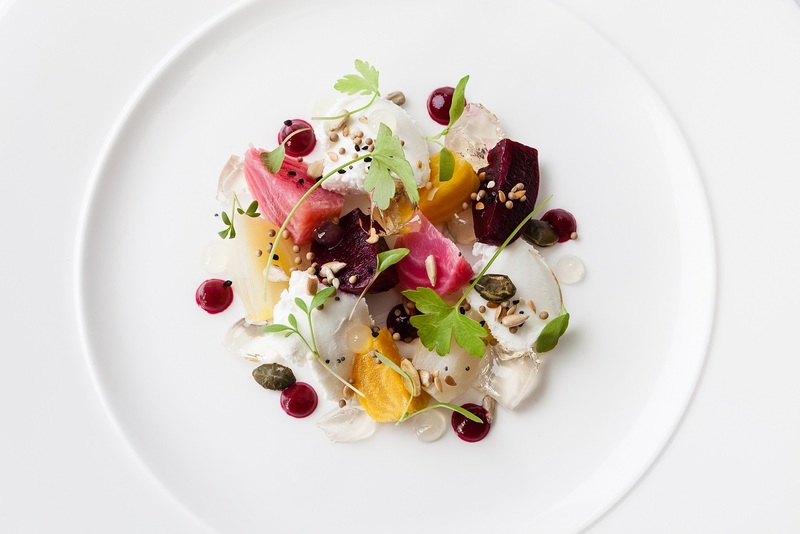 This recipe for Heritage Garden Beetroot Salad with Cheese was devised by Gravetye Manor’s head chef, George Blogg, to serve as a lunchtime starter. 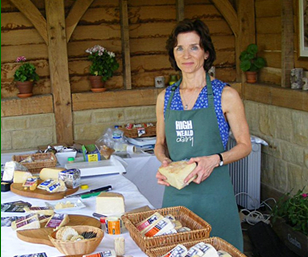 George Blogg’s original recipe uses High Weald Dairy Cow’s Curd. This is only available to caterers so we recommend making the recipe with Sussex Slipcote, our fresh sheep cheese. For the beetroots: Trim any tops and wash the beetroots. Put them in a saucepan, cover with water, add a generous pinch of salt and 20ml of white balsamic vinegar then simmer for 40 minutes, or until a skewer penetrates them easily. Remove from the heat and leave in the water to cool. When cool enough to handle easily, cut off the top with a knife, squeeze the beetroot out from the skin. Cut each beetroot into eight wedges – two of each colour per plate. The extra red beetroot needs to be chopped, blended with a little water and passed through a fine sieve to form a smooth purée. For the cheese: Add a pinch of salt and the double cream to a bowl and semi whip until ribbons start to form when you remove the whisk from the cream. Add the Sussex Slipcote to a bowl and beat with a spatula to soften. Add half the semi-whipped cream and fold in. Add the rest of the cream and fold in gently. Scrape the contents into a small container and refrigerate until needed. For the balsamic gel: Add 50ml of white balsamic, a pinch of salt, the sugar and agar agar powder to 150 ml of water and bring to the boil, whisking all the time. Simmer for two minutes, then pour in to a container and leave to cool for 10 minutes. When cool and set, blend and pass through a fine sieve to form a purée/fluid gel. For the toasted seeds: Mix the seeds together, add to the tray and heat in the oven at 160 degrees Celsius for 10 minutes. Leave to cool. To plate: Add three teaspoonfuls of the cheese to each plate followed by the pieces of beetroot. Pipe dots of the beetroot purée and white balsamic gel in to any gaps. Just before serving sprinkle the mixed seeds on (you don’t want them to lose their texture) and add the parsley cress. Delicious!